Amish-made portable buildings are an increasingly popular option for outdoor structure needs. With Kentucky’s growing Amish population, barns and other buildings sold in the Bluegrass State both come from Plain communities both in-state and elsewhere. Businesses selling Amish-built buildings can be found in a number of locations across the state. These include outlets within reasonable driving distance of Lexington, Louisville, Owensboro, Bowling Green, Paducah, Hopkinsville, Richmond, Florence (and other Cincinnati-area towns) as well as other areas of the state. See the listings below for a handcrafted barn dealer near you. Find Amish barns dealers in other states. Read more on Amish in Kentucky. USA Portable Buildings is a Louisville-area dealer for Amish and Mennonite crafted outdoor structures such as sheds, swing sets, playhouses, gazebos, pavilions, carports and furniture. Amish-built barns come in a few different styles including 4’Side Wall Barn or Lofted Barn with upper and lower storage. Broad selection of structure options such as body, trim and shingle colors available. Barns N More carries a broad choice of products including Utility and Lofted barns. Lofted barns come standard with treated skids and floor joists, groove plywood floor, ridge and gable vents. Broad choice of siding, trim, shingle colors and different size options. Barns N More serves Owensboro and surrounding areas; 45 min southeast of Evansville, Indiana. Outdoor Wonders is an Amish barns and sheds manufacturer, located a 20 minute drive south of Cincinnati. They offer Amish built barns and sheds made from solid materials. Each product can be customized by adding extra windows, or selection of trim or shingle colors. Hopkinsville-area All About Barns is a locally owned and operated business, around since 2002. They carry a wide selection of outdoor structures such as Amish built barns available in treated wood, vinyl, metal and log. Some models of Amish barns including Economy with single and double door and Lofted barn. Variety of metal roof colors, shingle colors, door and window options available. Tru Built Storage Barns was established in 1991. They offer services provided by a skilled Amish and Mennonite crew. Amish and Mennonite handcrafted mini-barns and high barns come in a range of options such as roof, metal and trim colors, wooden/vinyl/metal siding, floor, door options and more. Tru Built Storage Barns is located one hour northeast of Lexington. Kentucky residents: Please verify hours of Amish barn sellers given above. Business hours and locations can change. As a rule, Amish-owned businesses are closed on Sundays. However you may find non-Amish barn dealers to be open. Not responsible for any changes to the above info. Amish barns can be purchased in a number of ways in Kentucky. The most convenient option for many buyers may be to visit a local business carrying a selection of Amish-built structures such as barns. Some businesses offer online purchasing and delivery for those who have a good idea of what they need. Alternatively, some visit an Amish community to find and buy from an Amish manufacturer directly. With around 10,000 Amish living within its borders, Kentucky ranks as America’s 8th most-Amish-populated state (see Amish Studies website). Small Amish communities can be found scattered across the state in around 3 dozen locations. Amish have migrated to Kentucky in significant numbers, from more populous Amish states such as Ohio and Pennsylvania. Natural growth among the Amish, with families averaging 6-8 children, is responsible for much of the increase in Amish numbers, as is the case elsewhere in North America. Amish-run businesses are as much a feature of the landscape in many communities as are traditional dairy farms. In fact, farming has declined in some areas to the point that it is a minority occupation. On the other hand, some of the newer communities, particularly smaller and more remote settlements, may see a large percentage of Amish residents involved in agriculture. Amish in Kentucky run a wide array of businesses including retail stores, construction crews, and manufacturing businesses. Furniture, cabinet-building and construction of outdoor structures and buildings are common business fields for Amish in KY and beyond. When seeking an Amish-made barn, some buyers wish to visit an Amish community and attempt to find a barn from the source. 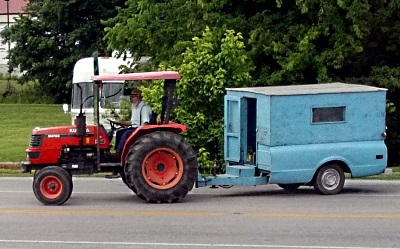 While not all Amish communities in Kentucky will have a barn maker, and while not all sell on a retail basis, this may be an option in some cases. Below are a few of the more populous Amish settlements in the state which may be home to an Amish-run business building barns and other structures such as sheds and garages. Amish-operated businesses are typically marked by simple road signs, and are never open on Sundays. Read more on the Amish in Kentucky. Munfordville/Horse Cave area (Hart & Grayson County): The state’s largest Amish settlement; lying an hour south of Louisville; around 2 hours southeast of Lexington. Over 1500 Amish live in this central Kentucky community. Small business is a significant part of the local Amish economy including a number of shops and retail stores run by local Amish. Hopkinsville area: Over a thousand Amish live in this community, which stretches across parts of three counties (Christian, Trigg, Logan). The area of Christian and Todd County is also home to a significant horse-and-buggy Mennonite presence. Guthrie (Todd County): The smallish community near Guthrie in Todd County near the Tennessee border is the state’s oldest Amish enclave. The Amish who live here are among the most progressive of all in Kentucky and North America; while maintaining signifiers of Amish identity such as buggies and plain clothing, Amish here permit both electricity in homes and the use of tractors for road travel. See Also Donnermeyer, Joseph F., and David Luthy, “Amish Settlements Across America: 2013”, Journal of Amish and Plain Anabaptist Studies: Volume 1, Issue 2 (October 2013) for more on KY Amish communities. looking for estimate on a 35x 40 a frame garage , has to match our house in our neighborhood. Boyer farms in clarksville tn 37043.no drywall. but need to be bricked. we. be on a concrete slab. My blog site is in the exact same niche as yours and my visitors would definitely benefit from a lot of the information you present here. I need a quote on a barn for my race car I live on 455 Halltown RD Portland TN 37148. My phone number is 602-284-2240. Hello, I am looking to order a 12X24 horse run in shed. We are located in Cincinnati, 45243. Any suggestions and or quotes would be greatly appreciated.